The earliest animals spent their lives on the bottom of the sea filtering water for particles of food—not unlike present-day sponges. With that lifestyle, they neither sensed nor responded to changes in their environment and, therefore, even a rudimentary nervous system would have been superfluous. In time, diffusely distributed nerve nets evolved in jellyfish-like animals, and they could sense touch and detect chemicals but responded with their entire bodies without more specific spatial discrimination. Then, some 550 million years ago, the hypothetical urbilaterian was said to have appeared. It exhibited bilateralism, with both sensory structures and nervous tissue concentrated at its anterior (front) end and connected to a nerve trunk that was capable of communicating with distant parts of the body. It is believed that vertebrates, worms, and insects all descended from this common ancestor, the urbilaterian, whose fossil remains have not been discovered. Over the next several hundred million years, the nervous system of descendent animals evolved to be able to coordinate body functions and act upon changes in their external environment and within their bodies. Ancient Greeks knew that the brain influenced muscle, and they believed that information from nerves was conducted by animal spirits. By the mid-eighteenth century, scholarly attention was directed to animal electricity. Based on studies conducted in frogs, in 1791 the Italian physician-physicist Luigi Galvani provided definitive proof that an electrical current in nerves was responsible for muscle contractions. The German physiologist Julius Bernstein, in 1902, proposed that this flow of current within nerve cells (neurons) was based on a voltage difference inside and outside the cells resulting from an uneven distribution of charged particles. In accordance with the neuron doctrine, each neuron is a discrete unit and is separated from adjacent neurons and muscles by synapses, which are physical gaps. Whereas electrical impulses are responsible for communication over long distances within the neuron, chemicals (neurotransmitters) carry messages over the short distances across the synapses. The release of a neurotransmitter occurs in response to electrical impulses and transmits the message to that nerve or muscle. SEE ALSO: Medulla: The Vital Brain (c. 530 Million BCE), Animal Electricity (1786), Neuron Doctrine (1891), Neurotransmitters (1920), Action Potential (1939). 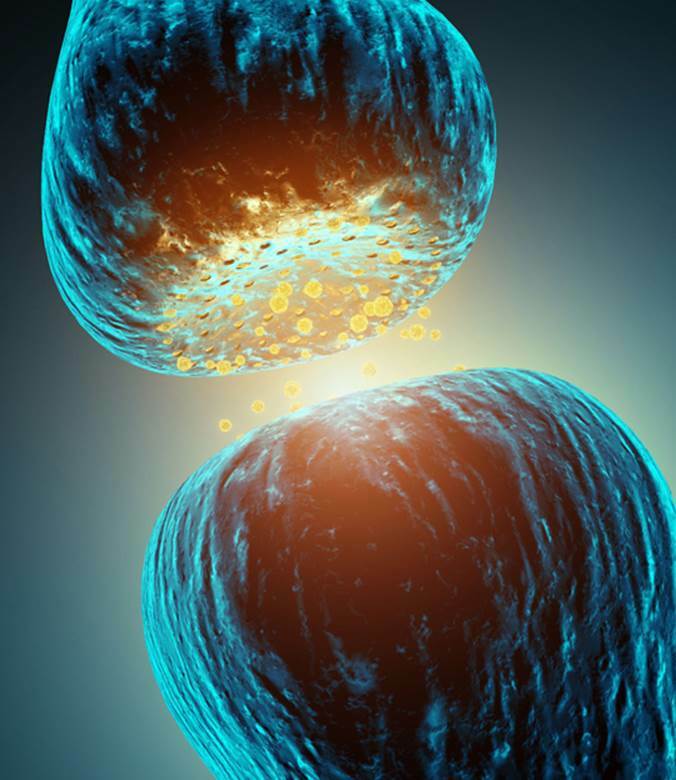 This illustration depicts the transmission of messages across a synapse (gap) between two neurons and mediated by chemicals called neurotransmitters.